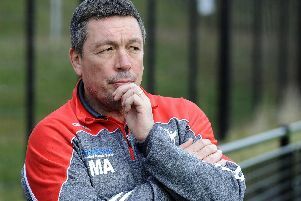 Sheffield Eagles boss Mark Aston has seen enough from his St Helens duo to suggest they could have an impact next season. The Eagles chief secured Liam Cooper and Jonah Cunningham, plus teammate Calvin Wellington, on loan until the end of the season, with a view to taking them on dual-registration for 2018. With Wellington injured, both Cunningham and Cooper were thrust into the firing line against Championship Shield leaders Toulouse. With two games in six days, Aston was keen to rotate his side to allow the likes of Jack Owens, Menzie Yere, Mark Mexico and Elliot Minchella return to the ranks against Bradford last weekend. Whilst Cunningham and Cooper were taken out of the firing line, Aston is confident that they will have benefitted from their experience, insisting that the Eagles following will not have seen the last of the pair. “The main aim of the loans was for me to see them in action,” Aston said. “They didn’t do themselves any harm against Toulouse. They were tough, they were physical and they didn’t look out of shape which was good because sometimes when you come out of the academies, you can struggle because this competition is physical. “They are good kids that St Helens believe in and we believe in. “It is great for us to understand what they were about, and I am sure that they will be part of our dual-reg partnership next year. Eagles host Rochdale Hornets this weekend in what could be their last regular season appearance at Wakefield’s Belle Vue stadium.